Our website address is: http://cccontracting.com. User supplied information: If you fill out the contact form on this website, we will ask you to provide some personal information (such as e-mail address, name, phone number and state). Further, if chat is available through this site, you may be asked to provide information if you participate in an online chat. Please do not submit any confidential, proprietary or sensitive personally identifiable information (e.g. Social Security Number; date of birth; drivers license number; or credit card, bank account or other financial information) (collectively, “Sensitive Information”). If you submit any Sensitive Information, you do so at your own risk and we will not be liable to you or responsible for consequences of your submission. 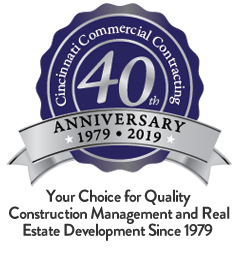 Unless indicated otherwise, this Site and all content, information, images, data, and materials on this Site (“Content”), and all intellectual property rights associated with the Content, are the property of Cincinnati Commercial Contracting or its licensors. This Site and all Content are protected by copyright and other intellectual property laws. All rights are reserved. We also maintain all rights, title and interest to the content we post on other online communities, such as Facebook, Twitter, and Instagram. This website may include links and references to websites and documents published by third parties (“other sites”) for your convenience and information. We do not control and are not responsible for other websites and their activities, products, services, or content. By using this Site you are agreeing that you will not engage in any conduct or submit to this Site any Content or other material that is illegal, inaccurate, misleading, misappropriated, infringing, dilutive, defamatory, obscene, offensive, or otherwise objectionable. By using this Site you are also agreeing that you will not take any action or engage in any conduct that causes damage, embarrassment, or adverse publicity to Cincinnati Commercial Contracting.